This is a doll`s dress my grandmother sent me from America when I was five. She made complete wardrobes of outfits for my dolls and they arrived in large wooden packing crates. She was a wonderful seamstress and the care with with she finished the clothes, stitching linings and collars and tiny button-holes, is amazing. I have kept the dolls` clothes as a token of her love. Now I realise that she must have been lonely – she was a widow – and that the time she spent stitching must have represented a great deal of time on her own, thinking about the grandchildren who lived across the Atlantic, too far away to see. 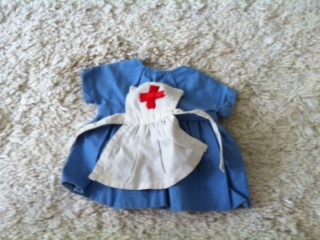 This is a nurse`s dress and it reminds me that when I was a child all the girls I knew wanted to be nurses. We were still in an era when only men were doctors. We wanted to look after other people, that was how we were encouraged to see our lives and careers. I`m not sure girls wear nurses` outfits much now. They dream of being princesses instead. Elizabeth Burke, Radio Producer, London.